Click here for other info about Apex Orchards on CISA’s website. Among Northampton’s Tuesday Market regulars, Apex Orchards may be best known for one thing: apricots. When the apricots come in, people line up at Apex’s stall, eager for this year’s crop of the soft, delicate fruit. Tim Smith, the owner of Apex Orchards, agrees that the apricots are special. “A lot of people have never tasted a fresh apricot,” he observes, noting that Apex is one of the only farms in the Pioneer Valley that grows the fruit. Of course apricots are not Apex’s only crop, and despite the palpable excitement at the farmers’ market when the apricots are introduced, customers also regularly enjoy Apex’s other offerings. Apex grows many varieties of peaches, nectarines, plums, pears, and apples, along with grapes and blueberries. The farm sells honey under the label “Shelburne Honey Company,” and even grows a small variety of kiwis. Apex sells at farmers’ markets across the state, as well as local grocery stores and co-ops, including River Valley in Northampton, Greenfield’s Market and Foster’s in Greenfield, the Leverett Co-op, and Wild Oats in Williamstown. And they have a thriving pick-your-own business at their idyllic Shelburne location. The community focus on buying local in the Pioneer Valley has provided Apex Orchards with a sizable and loyal customer base. And there are particular advantages to selling to people in this way. “People who are interested in buying local aren’t concerned about whether the fruit looks perfect,” Tim remarked. “They just care about the quality of the fruit.” This is very different from his experience with the wholesale apple business, which focused on producing a uniform product. Local customers can also be counted on buying the farm’s “seconds,” fruit that is slightly damaged, for preserving and pie making. 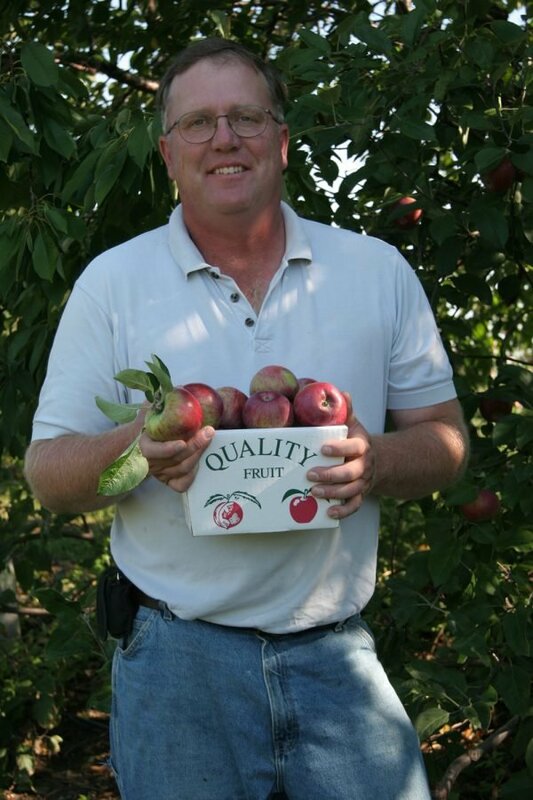 The growth of CSAs has benefited Apex Orchards, as Tim describes a very positive relationship with many area CSAs who sell his fruit along with their own produce. Tim has also been very impressed by the development of local co-ops. One local co-op buys up to 100 boxes of his peaches a week during peak season. Tim credits the location of his farm for part of the family’s success. “This is a unique microclimate for growing apples,” he observed, crediting the magnesium-rich soil and the combination of warm days and cool nights during the fall as factors that produce delicious, beautifully colored fruit. Apex’s hillside location also helps. Tim points out that orchards in lower elevations often suffer during cold spring nights, as cool air gets trapped and harms the trees. Even with last year’s strange spring weather, Apex’s crop was bountiful. In fact, Apex has not lost a crop since 1942. The land around Apex Orchards is lovely. The road winds past the farm store and up the hill to a newly acquired 170 acres Apex is developing into additional pick-your-own orchards. The views from this part of the farm are breathtaking. 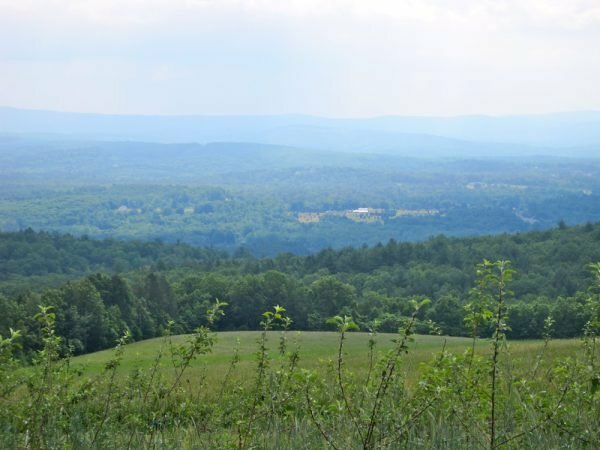 From a spot in the new orchards, an Apex customer will have an expansive view of green fields and forests, with the distinct profile of the Seven Sisters to the south, and far to the north, the unmistakable shape of Mount Monadnock. It is a beautiful, peaceful place for a family to spend an afternoon, or in the case of Tim’s family, a couple of centuries, picking fruit.